Does Poly Guard protect against UV? 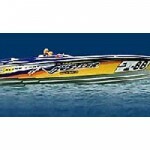 I was thinking of buying your speed clean and poly-guard products for my Caribe C12 Inflatable. My only concern is what I have to do to get a patch to stick well to areas where these two products have been used. What, if any, preparation is necessary before patching areas treated with your product? Does the poly-guard product add any additional UV protection to the Hypolan? Do you make a product that UV protects. If yes, how does it effect preparation for patching? Speed Clean and Poly Guard do not contain oils, silicones and Teflon that can affect the adhesion of patches. Use Speed Clean to clean, restore and prepare the surface of the tube on your boat for proper adhesion of Poly Guard. If ever you have to strip Poly Guard, you can use Speed Clean to do this. To prepare for patching, first strip the Poly Guard with Speed Clean and then follow the manufacturers directions for preparing the surface for the patch. This usually involves sanding or scuffing the surface and wiping with MEK or Toluene or another solvent to partially dissolve the fabric prior to applying the adhesive. Poly Guard has excellent UV protection properties to protect against fading and chalking, plus it also protects against scuffing, staining and damage from suntan oil and diesel. It will also make maintenance much easier and facilitate the removal of exhaust soot, bird droppings etc. which seem to be a big problem for inflatable boats in general. You will love the low luster shine. Many people claim that it even improves the appearance of a brand new boat.